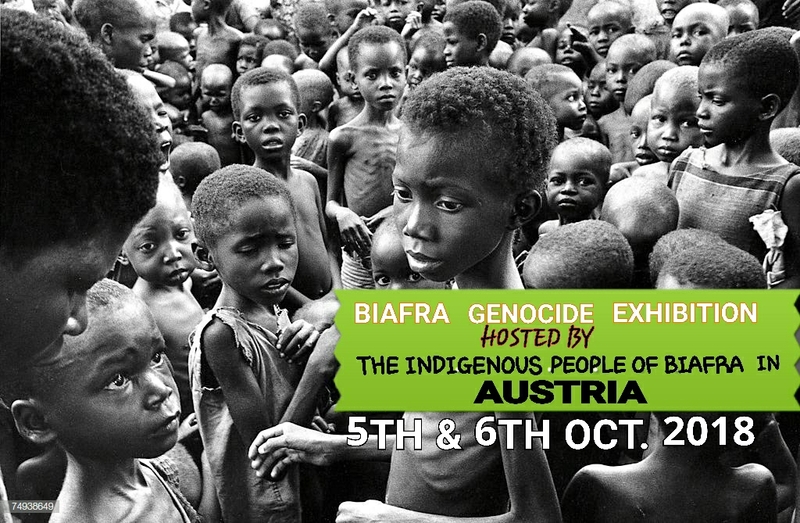 VIENNA - The Indigenous People of Biafra (IPOB) in Vienna, Austria has announced its readiness to stage the fifth edition of Biafra Genocide Exhibition (BGE) in the country. In a circular issued by Vienna’s Zonal Coordinator, Engr. Umeh Chijioke Michael, the exhibition is billed to last from 5th to 6th October, 2018, with the purpose of drawing the attention of the international community to the sordid plight of Biafrans in Nigeria. IPOB Austria which boasts of an existing cordial relationship with the government and security forces of their host country, invited Biafrans, heads of organizations, including members of the press from different parts of the world to participate in the event even as it noted that the opportunity will also serve as an avenue to rub minds together on the way forward for the Biafra restoration project. 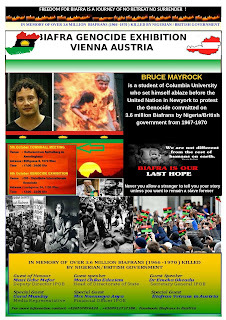 Part of the statement reads: “The Indigenous People of Biafra (IPOB), Austria are inviting all men and women of good conscience to our Biafra Genocide Exhibition in Vienna Austria. “Members and leaders of human rights and international organizations, journalists has indicated interest to be present in this exhibition. Our war veterans are not left out. 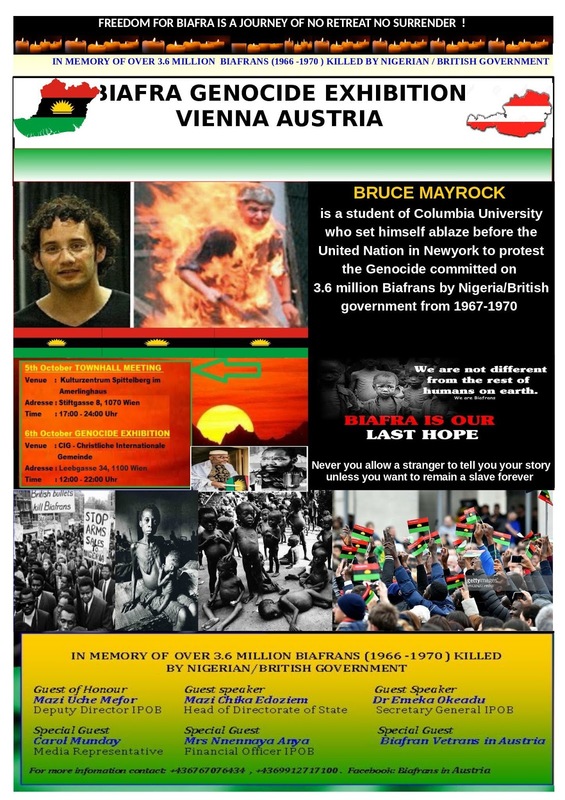 Biafrans and friends of Biafrans all over the world are expected to honour this invitation which will hold in the beautiful and ancient city of Vienna-Austria. Austria has remained and are still playing a very vital role in the international politics. Taking the advantage of being position in a central Europe that housed a lot of international offices, like United Nation, OPEC and many others. “We all must encourage and support IPOB Austria in this very task. IPOB Austria has a very good and cordial relationship with their host country and security forces, testimonies to the tens of peaceful protests and rallies undertook by the IPOB Family in Austria both in the capital city, Vienna and in other states across Austria without report of violence. “We have remained peaceful in all our approaches. 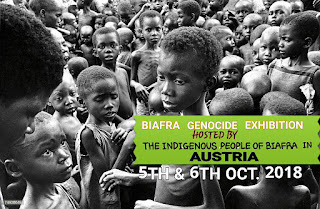 We want to use this opportunity of our Genocide Exhibition to thank the good people of Austria especially the humanitarian support they gave to Biafrans during the war of genocide by Nigeria government which left over 3.5million Biafrans dead including children who were starved to death. The circular further disclosed that on the 5th of October 2018, a Town Hall meeting shall be held at Kulturzentrum Ameringhaus with the address, Stiftgasse 8, 1070 Wien by 17:00-24:00 Uhr while on the 6th of October 2018, the exhibition will take place at CIG Christliche Gemeinde with the address Leebgasse 34, 1100 Wien by 12:00-00 Uhr. It gave out its contact numbers as: 004369912717100 or 0043676707643 and an email address as: [email protected], for further enquiries. It should be recalled that BGE was first activated in Spain on March 10-12, 2017 which was solely aimed at showcasing inhumane treatment meted to Biafra agitators by the federal government and its security agencies. The intention of the Biafrans was to also use the exhibition to expose to the world the atrocities that the Nigerian government – and its wicked and unkind population – unleashed on the Biafran people under the guise of a genocidal war (urged on by the British government) from 1967 – 1970. The Biafrans also wanted the world to know about the current genocide being perpetrated against them currently since Buhari took the reins of power in Nigeria.